Bro. (P.J.Stephen Paul) has received a higher calling from God when he was at the age of 16 and was anointed by the Holy Spirit. According to God’s call on his life, he surrendered completely his life to God in his very childhood, and was filled with lot of Compassion and great Burden for Souls perishing in this world. 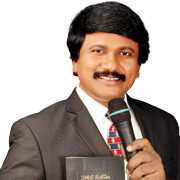 God Gave him the Ministry of the Holy Spirit, which is leading in a victorious and a powerful way to reach out for the souls in India and in many countries.